China successfully carried out the first launch of its next-generation Long March 7 rocket. The country’s most powerful launcher took to the skies at 8 p.m. Beijing time (12:00 GMT) on Saturday, June 25, from Site LC-2 at the Wenchang Satellite Launch Center on the island of Hainan. It was carrying a prototype of a re-entry capsule and several small satellites. After launch, the rocket started a short vertical ascent before turning southeasterly over the South China Sea. Four strap-on boosters powered the Long March 7 during the initial phase of the flight for slightly more than three minutes until their separation. Then the first stage itself accelerated the rocket for about 15 seconds before it was also released. Afterward, the mission relied on the second stage and its four engines. The launch vehicle continued its flight toward orbit until it detached from the optional Yuanzheng-1 (YZ-1) upper stage. Then the mission entered its final phase, which included a series of four tests burns of YZ-1 and orbital injection of the capsule and satellites. However, due to very little information being released by the Chinese media about the mission profile, the exact time of payload separation is uncertain. According to various speculations by Western analysts, the flight lasted slightly more than 10 minutes, counting from liftoff to orbital insertion. The re-entry capsule is expected to land between 3 a.m. and 4 a.m. EDT (08:00 GMT) on June 26 in a remote area in Inner Mongolia. This scaled-down model of a re-entry capsule will test the descent capabilities for future crewed flights. The rocket was delivered to the Wenchang Satellite Launch Center in May 2016, where it was assembled. Next, the booster underwent a set of initial checkouts to fully prepare it for its rollout to the launch pad, which took place on June 22. The Long March 7 rocket is a 174.2-foot (53.1-meter) tall two-stage launch vehicle. It was developed by the China Academy of Launch Vehicle Technology (CALT) and is based on the Long March 2F rocket. The nearly 600-metric ton launch vehicle is 11 feet (3.35 meters) in diameter and is capable of lifting up to 13.5 metric tons to a low-Earth orbit (LEO) and about 5.5 metric tons to a Sun-synchronous orbit (SSO). The rocket is fitted with four strap-on boosters powered by YF-100 engines. Each booster is attached to the first stage of the launch vehicle, which is 11 feet (3.35 meters) in diameter, and is equipped with two YF-100 engines. The second stage has the same diameter as the first; however, it is powered by different propulsion units – a set of four YF-115 engines. The YZ-1 upper stage is optional and is capable of delivering a payload into a variety of orbits. The Long March 7 is expected to become the main launcher for future space missions including those to transport cargo for China’s planned space station. The country also hopes that its new rocket will be more environment-friendly than previous launchers in the series. The new booster relies on liquid oxygen and kerosene as fuel, which is cheaper and less dangerous than those used by some their earlier launch vehicles. Long March 7 is designed to be more weather-resistant than its predecessors. The booster is waterproof and can be launched on rainy days. Moreover, the rocket is equipped with wind-resistance devices allowing it to withstand gales during its flight into space. The capsule launched on Saturday’s mission, features a Global Navigation Satellite System (GNSS) antenna, parachutes, and an antenna specially designed to prevent radio silence during hypersonic re-entry. The spacecraft is being designed with the aim to serve as a future transportation system for cargo and crews to LEO and beyond, including possible missions to the Moon. According to various media reports, the mission also carries a CubeSat, a block of ballast, and two other small satellites named ADRV and BPV. The launch marks the first liftoff from the Wenchang Satellite Launch Center; the construction of the site was completed by the end of October 2014. The center was selected for its low latitude, which will allow for a substantial increase in payload, necessary for the future crewed programs. The launch site, thanks to its location on an island, enables easy transportation of the large rocket components by ship and ensures that rocket debris descending from the sky falls into the ocean instead of over populated inland areas. However, according to Liu Xiaohua, a senior engineer at the Wenchang center, this location records more than 100 days of thunderstorms annually. Because of this, four 105-meter steel lightning conductors were installed to protect the site from this threat. They surround each launch pad and are effective against nearly all thunderstorms. Moreover, a special anti-corrosion cover is used on metal surfaces at the center, to protect against the moist and salty environment. The launch was open to the public. Up to 25,000 spectators were able to view it in person for the first time in the history of Chinese orbital launches. For this occasion, the government designated eight viewing areas. The maiden flight of Long March 7 was the eighth orbital mission for China this year. 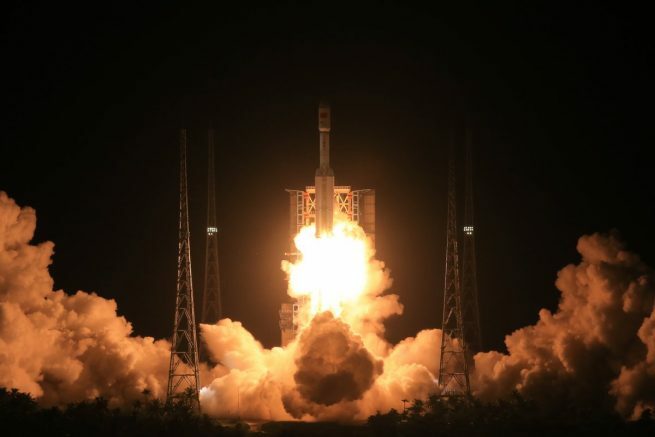 It was also the 230th launch of the Long March rocket series. 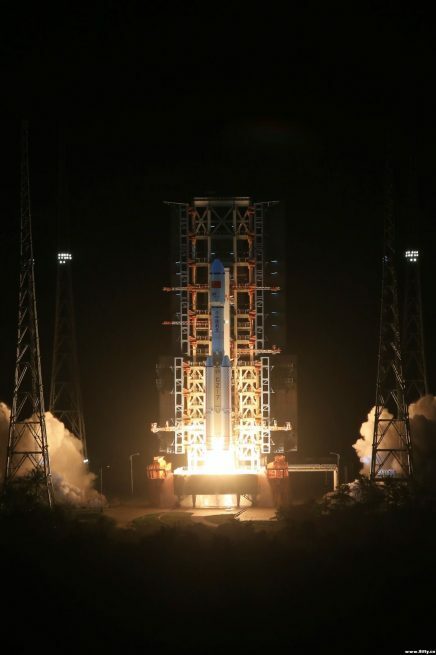 The country’s next mission is currently scheduled for July when a Long March 2D booster is slated to send the QUantum Experiments at Space Scale (QUESS) technology demonstrator into orbit from the Jiuquan Satellite Launch Center in Gansu Province. However, the exact date of the launch has yet to be announced. What is the real Mars plan of Elon Musk? Is it going to be available for international customers and price-competitive? China have built itself a first class spaceport. They have come a long way since the 1970’s with their economy & technology, no matter how they acquired it. I wish China the best of luck in their vehicle launches, space station & other BEO plans.